It feels good to be back to our regular schedule! After a crazy September, with me being sick for two weeks, on vacation, and then celebrating our one year anniversary of owning the store...I feel like I've been playing catch up and was missing out on our twice a month challenges. Aren't you excited about this week's challenge of watercoloring? I adore Giovana's card...it's simply beautiful! Sarah - Great job on your altered box! I love the theme, the checkered floor, and the so sweet and tiny furniture. Seriously, how cute is Sarah's creation! Sarah, please contact me at kim@eclecticpaperie.com to claim your $15 gift certificate! A HUGE thank you to everyone who participates in our challenges. It really is such a delight to have you with us!! Until next time...happy crafting! Congratulations Sarah! 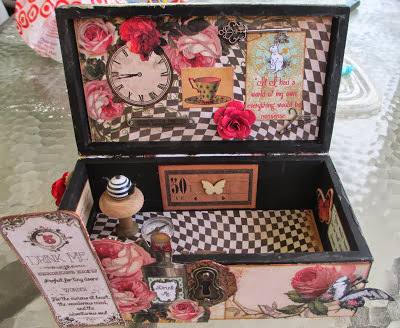 Beautiful altered box. Congrats, Sarah! Your altered box is BEAUTIFUL! OMG thank you, I am shocked! Just browsing over to the blog and I'm so thrilled...loved this challenge!